Refreshingly light and guilt free! A serving is generally considered between 100 and 150 grams. Place on top of your favorite mixed greens, top with a little goat cheese and your favorite finishing oil. We used pumpkin seed oil in this particular recipe. This is an excellent salad, and you can prepare it quickly and refrigerate for a few days. What a great lunch salad, easy fast and protein packed! Drain 2 cans of tuna of oil and add in a mixing bowl to the other 2 cans with oil. 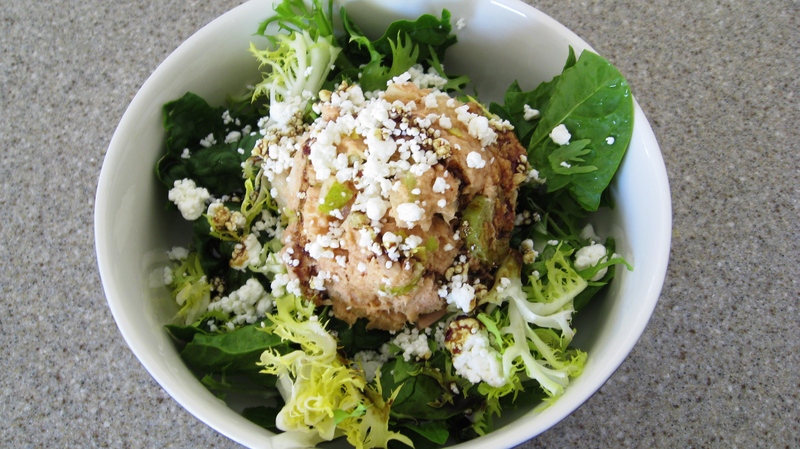 Combine tuna with sea salt, lemon, sesame oil, and cayenne and blend with a hand-held blender until smooth. Then stir in chopped celery and pear. Yummy! I like the idea of adding pear. I’m going to try this for dinner.